The 15 inch MacBook Pro with Retina Display can be ordered with one of three different CPU options. The base model, available for $1,999, ships with a 2.0 GHz quad-core Intel Core i7-4750HQ Crystal Well processor with 6 MB on-chip L3 and 128 MB L4 cache. This was our test machine, with 256 gigabytes of storage and 8 gigabytes of RAM. It can be upgraded to either a 2.3 GHz quad-core Intel Core i7-4850HQ version, or a 2.6 GHz quad-core Intel Core i7-4960HQ with 6 MB on-chip L3 cache. All three options provide integrated Intel Iris Pro 5200 Graphics with DDR3L SDRAM shared with main memory and an optional discrete Nvidia GPU: the GeForce GT 750M with 2 GB dedicated GDDR5 video memory. The OS X operating system automatically switches between integrated and discrete graphics hardware when running OS X.
Apple's new Macs all ship with with Mavericks, the company's latest operating system, as well as free copies of the iLife and iWork suites. 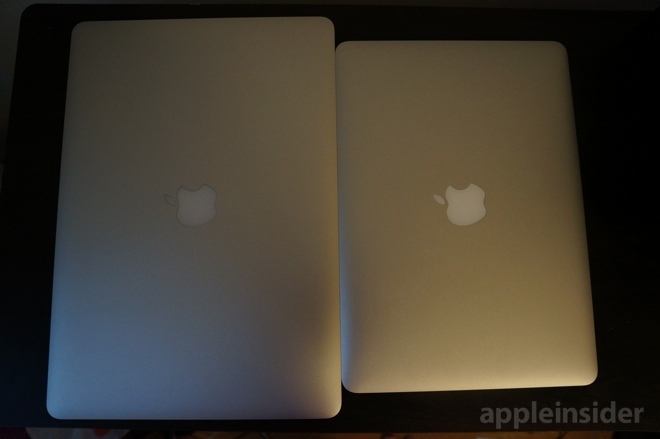 The 15-inch MacBook Pro looks identical on the exterior to its predecessor. On its left are a MagSafe 2 charging port, two Thunderbolt 2 inputs, a USB 3.0 port, 3.5-millimeter headphone jack, and two microphone holes. The right of the notebook has another USB 3.0 port, HDMI out, and a full-size SD card slot. Also returning is the fantastic 15-inch Retina display that debuted in Apple's 2012 model. It's a 2,880-by-1,800-pixel panel packing in 220 pixels per inch. Like last year's model, this has the same great viewing angles, thanks to the IPS technology found in the panel, as well as relatively low glare. 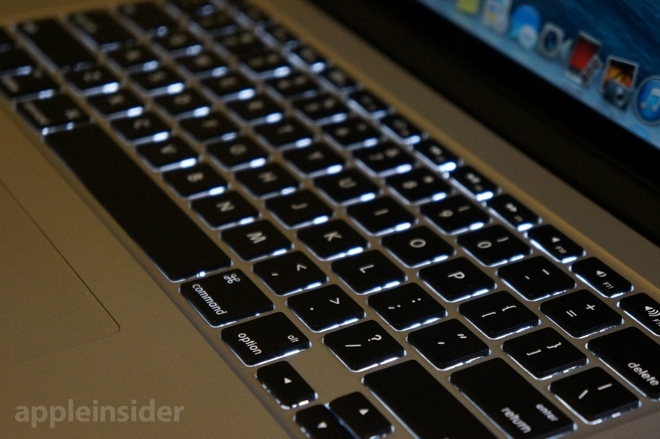 Unlike the 13-inch model, which houses the speakers under the keyboard, the 15-inch MacBook Pro has room for speaker grilles on each side of the notebook's keyboard. Accordingly, the sound on this model is louder and slightly clearer and work fine, though headphones or external speakers are still recommended for any true fidelity. Apple's high-end MacBook also comes with 256 gigabytes of solid-state storage, configurable up to 1 terabyte. The entry-level storage is twice that of the 13-inch model. 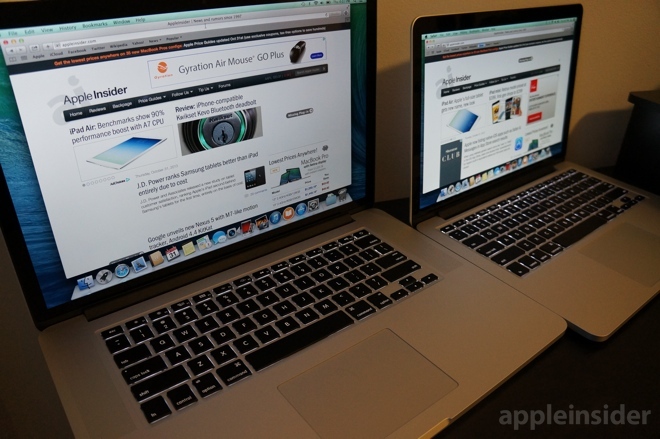 Left: 15-inch Retina MacBook Pro. Right: 13-inch model. As with Apple's new 13-inch model, the highlight of the 15-inch MacBook Pro with Retina display is Intel's latest silicon. While the 13-inch chips are known as Haswell, the 15-inch model sports more premium chips dubbed Crystalwell. Crystalwell is Intel's brand for fourth-generation Core processors based on the same technology as Haswell but paired with a more powerful Iris Pro graphics. In the same family, Intel also offers Haswell processors paired with simpler, significantly inferior HD Graphics, as well as "ultra low" and "ultra low extreme." For the 15 inch MacBook Pro, Apple is only offering Crystalwell chips, which further upgrade Intel's much improved Iris-branded integrated graphics on Haswell processors with "Iris Pro," the primary feature of which is its additional 128MB of eDRAM (embedded DRAM) bundled on the processor package itself. This specialized memory can both be used for graphics or as an overflow L4 cache assisting the 6MB on on-chip L3 cache. It's a design similar to dedicated video game hardware such as Microsoft's Xbox 360, Sony Playstation 2 and the A-series chips Apple designs for its iPhone and iPad. 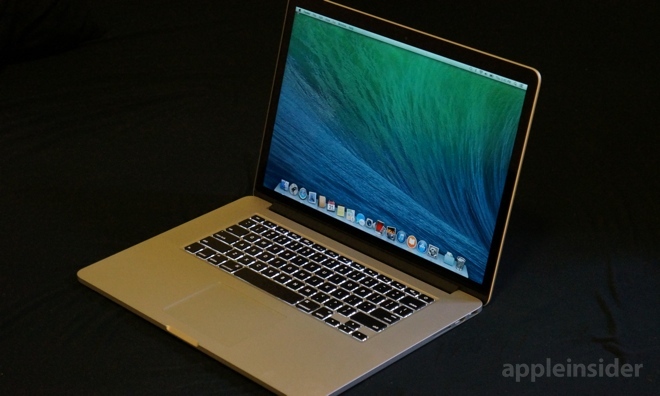 Intel's Haswell microarchitecture was first used by Apple this summer for the MacBook Air. Haswell aims to deliver high power efficiency, benefitting from Intel's advanced FinFET transistors built at a 22nm process node. The chips improve upon the previous Core i5 Ivy Bridge design by incorporating a second branch predictor (used to optimize the flow in the instruction pipeline), a third address generation unit (used in memory access) and a fourth arithmetic and logic unit, along with higher bandwidth cache. Haswell chips also include new instructions enhancing SIMD vector processing with Advanced Vector Extensions 2 and integrates the Platform Controller Hub and voltage regulator into the chip package itself, rather than being separate components on the logic board. Along with a series of other advances and optimizations, Haswell is intended to be much more energy efficient while also being slightly faster even at a lower clock speed. Accordingly, latest chips are focused on efficiency, improving battery life to a significant degree. In our tests, the battery performance on the new 15-inch MacBook Pro was excellent, and comparable with the 13-inch model. Both strong enough to easily get through an average workday with Wi-Fi enabled and backlight at a reasonable setting. For its part, Apple advertises that the 15-inch Pro gets 8 hours of use, but our tests suggested it could exceed that amount. For comparison's sake, we also ran a more extreme battery stress test, with maximum brightness, keyboard backlight on, streaming a high-definition video from YouTube. In this taxing scenario, the MacBook Pro lasted over four hours before warning it needed to be plugged in. In terms of raw performance, the 15-inch MacBook Pro easily outclasses the 13-inch variety. In a 32-bit multicore Geekbench test, the 15-inch model showed almost twice the horsepower. An OpenGL test in Cinebench also resulted in 20 more frames per second than the 13-inch model. Also welcome is the fact that the 15-inch model comes standard with 8 gigabytes of RAM. This is an improvement from Apple's entry-level 13-inch model, which just ships with 4 gigabytes— a number borderline unacceptable in 2013. Spending nearly $2,000 on a notebook is no small investment, but we're happy to report that the 15-inch MacBook Pro with Retina display is worthy of its price tag. Including a beautiful Retina display, a premium Core i7 processor, 256 gigabytes of speedy flash memory, and Intel Iris Pro graphics in the default low-end configuration makes this machine worthy of its "Pro" designation. The 15-inch model also comes with 8 gigabytes of RAM by default, and still manages to offer a full day's worth of battery life on one charge. Apple's premium notebook offers much better value at its entry-level price than the company's 13-inch variety, which is held back by 4 gigabytes of RAM and 128 gigabytes of storage at $700 less. Base pricing on the 15-inch model has also fallen from $2,199 to $1,999, offering even more value for buyers. If there's any significant knock against the 15-inch model, it's the fact that Apple doesn't include a discrete graphics card in the base model. Users looking for dedicated graphics beyond Iris Pro will need to splurge and get the $2,599 model, which includes an Nvidia GeForce GT 750M, as well as 512 gigabytes of PCI-e-based flash storage and 16 gigabytes of RAM. For notebook shoppers who aren't drawn to the portability of the 13-inch Retina MacBook Pro, Apple's 15-inch model is an easy recommendation. This is a true professional-grade machine that doesn't disappoint. 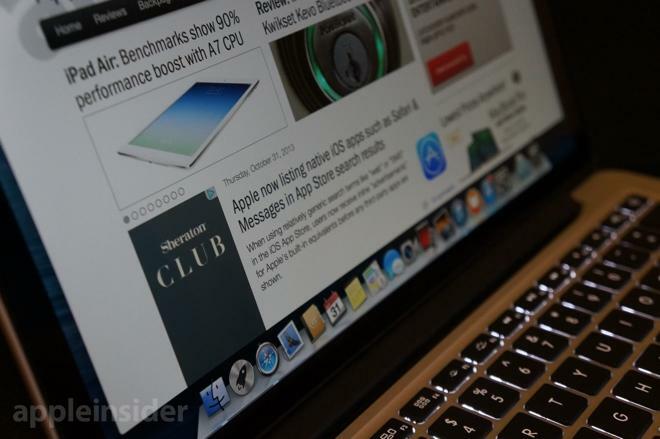 AppleInsider editor Daniel Eran Dilger contributed to this review. AppleInsider extends its thanks to Apple Authorized Reseller B&H Photo for sponsoring this year's MacBook Pro Retina review series. The New York-based superstore recently took home top honors in Consumer Reports' 2013 electronic stores rankings for overall customer service and satisfaction. MacMall also only charges tax to residents of CA, NY, IL, WI, MN, CO, TN, NC and GA. This means that —on most models —customers outside those states will save at least another $100 from the tax savings, in addition to the 3% exclusive discount. Alternatively, if you'd like to bundle a 3-year AppleCare Extended Protection Plan with your new MacBook Pro Retina, AppleInsider also maintains a Mac+AppleCare Price Guide listing the combined prices for each new Mac model along with 3 years of AppleCare. As can be seen in the relevant portion below, the lowest prices on these bundles sometimes come from MacMall, but are more often available at B&H. For its part, B&H exclusively offers readers instant savings of between $70 (13-inch models) and $105 (15-inch models) on AppleCare protection plans for the MacBook Pro. In addition, B&H only charges sales tax to residents of its home state of New York. An easy 5-step help guide is also available to show precisely how to pair an AppleCare protection plan to your new Mac at B&H's reduced pricing. Other options include Amazon, which only charges sales tax to residents of AZ, CA, KS, KY, NJ, NY, ND, PA, TX, and WA; and BestBuy, which sometimes offers in-store pickup of online orders.